The Atlantis Above Ground Swimming Pool is a high quality steel above ground pool with features normally found in pools costing hundreds more. The 52" wall Atlantis pool is made of heavier gauge steel than that found in many other pools, and the rugged 6" top rails and 5 1/4" fully supportive uprights provide heavy duty support needed for years of enjoyment. ProtectAll decorator resin seat caps give the Atlantis a deluxe upscale look and helps make this one of our best selling above ground pools by far. Atlantis pools have many layers of Texture-Kote (on the top rails and verticals) and Protectoloc (on the walls) to protect your pool from rust and corrosion. Because of the patented application process, the pool wall, rail, and vertical coatings will not chip, peel, or splinter. Atlantis pools are manufactured to last and look great years down the road. 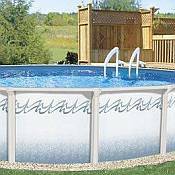 All Atlantis pools are designed to assemble quickly and easily by do-it-yourselfers. A free installation DVD will provide you with step-by-step instructions and makes pool set-up a snap. Invest in an economical Atlantis pool this spring and enjoy your own backyard pool this summer. We offer a couple of pool packages. You may purchase the pool wall and skimmer only if you already have everything else, or you may choose one of our complete pool packages.